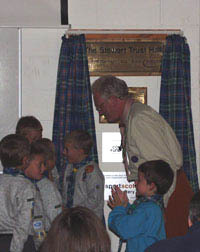 The Stewart Trust Hall was Officially Opened on Friday 21st September 2001 by the Chief Scout George Purdy. 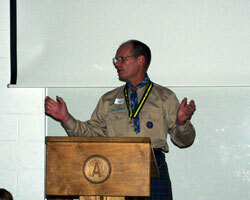 During his Group Chairman's address, Bruce Cameron took the opportunity of this special event to praise and thank all those who had made the development and building of the Hall possible. 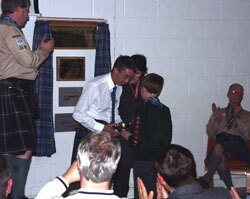 In particular he thanked Councillor Alan Kenney and Fife Council who had been instrumental in securing the land on which the Hall was built. 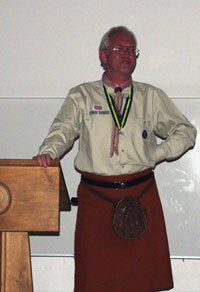 (See History of the Hall). 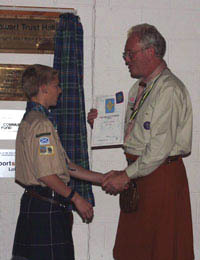 He went on to explain that a National Lottery Grant had secured 75% of the costs, with the rest made up from donations from SportsScotland Lottery Fund, the Scout Association, and a donation from the Crossford property developer, Alfred Stewart. 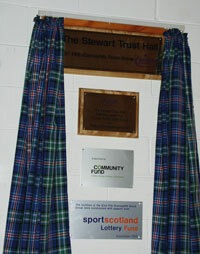 In recognition of this the Hall is named in memory of Mr Stewart's wife. 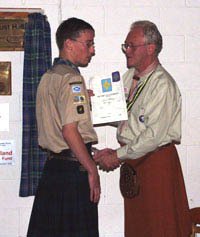 He went on to show how the Scout Group had developed from its founding by Douglas Fotheringham to become a strong, developing Group with a confident future. 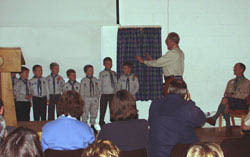 Bruce told the audience that there were many people who had contributed so much to this project, from the architect and builders, to many others who had given their time, mostly on a voluntary basis to make the Hall a centre piece for all the community, not just the Scout Group. 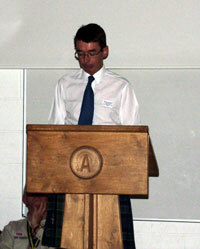 Bruce explained that the community at large are able to hire and use the building to its full potential, thereby making it such a valuable asset within Cairneyhill and the surrounding area. 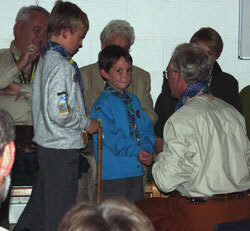 The Chief Scout, George Purdy, was then asked to perform the Official Opening. 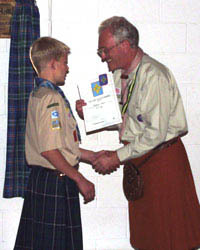 In his opening remarks, he expressed pleasure in attending this event because he knew the 83rd Fife (Cairneyhill) Scout Group as a well known and highly regarded Group within the Scouting Movement. He congratulated all who had been instrumental in the building of the Hall and felt sure that it would be used to its full potential. 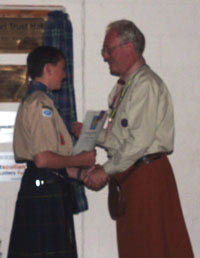 The Chief Scout was then called upon to present four Scouts with their Chief Scout's Award. 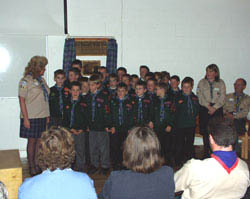 Following this, the Beavers and Cubs gave a short presentation of "Campfire" songs. 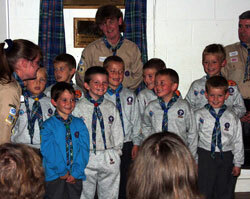 As a thank you from the Group, Beavers made a presentation gift to the Chief Scout. 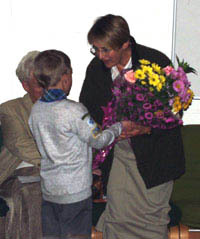 His wife received a bouquet of flowers. Chairman Bruce Cameron was also given a gift from the Group in recognition of his leadership during the development and building of the Hall. 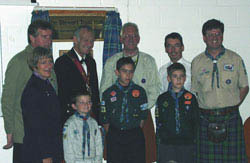 Special guests Rachel Squire MP, Councillor Alan Kenney, Depute Convenor Andrew Paterson, and Chief Scout George Purdy photographed with Bruce Cameron and Callum Farquhar.